The Scrub-birds are a small Australasian family composed of just two species in the genus Atrichornis: the Rufous Scrub-bird (left in a great photo by Michael Morcombe) and the Noisy Scrub-bird (painting below). Both are difficult birds to observe, so Michael Morcombe's photo of one in full song is quite wonderful. He tells me he took this shot in 1968 when traveling about Australia, photographing birds, in a trailer with a wife and 3 kids! [see his Australian website for more on his photography; he also has a new field guide out for the continent]. Scrub-birds are an ancient Australian family that are apparently most closely related to Lyrebirds (Sibley & Ahlquist 1990). Rufous Scrub-bird is found only in thick undergrowth in forests of coastal eastern Australia. The Noisy Scrub-bird (below) is limited to thick coastal scrub in extreme southwestern Australia where it is endangered. 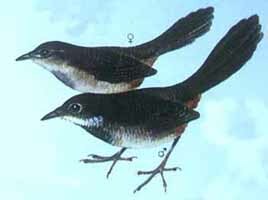 Both species of scrub-bird are sedentary and live only in isolated patches. Blakers et al. (1984) say that "even when Europeans arrived, the distribution of Rufous Scrub-bird was that of a relict species, fragmented populations surviving in patches of suitable country." It requires a dense layer of ground cover at least 1 meter high, abundant leaf litter (in which they feed), and a "moist microclimate at ground level." This habitat is found only in the coastal mountains of s. Queensland and n. New South Wales. At the time of the Australian bird atlas (Blakers et al. 1984), Noisy Scrub-bird was known only from Mt. Gardner in Two People Bay Nature Reserve in Western Australia. It had been thought to be extinct, but was rediscovered in 1961. Both species were threatened by habitat loss and, especially, fires. "Fires started by early settlers and forest managers became too frequent to allow the bird's invertebrate food supply to survive in the forest, though nesting areas were little damaged .... Experience suggests that the heath and forest needs to be free from fire for 8-10 years to regenerate a sufficiently deep litter layer to support a Noisy Scrub-bird population" (Blakers et al. 1984). Populations of Noisy Scrub-bird have slowly increased with management and protection from fire. Territorial males were estimated at only 40-45 birds in 1965, but these numbers increased to a total population estimate (including the singing males) of perhaps 400 birds by 1985 (Simpson & Day 1996). Active intervention and the establishment of additional sites, through translocation and recolonization, has now upped the population level to perhaps 1500 birds (Birdlife International 2002). 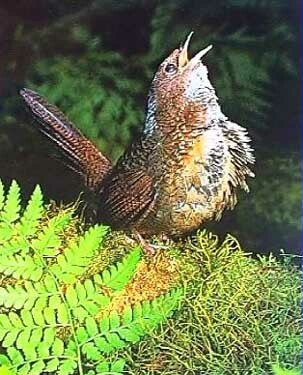 The males of these two rare species display rather like immature lyrebirds with elevated and fanned tails, lowered wings, and with the body quivering from the effort of sustained, loud, melodious song and mimicry. The birds live in dense cover, are 'ground-hugging' species that run fast; are 'camouflaged' by virtue of being brown and in the shadows. Domed nests are close the ground with small side-entrances and are lined with thin, papery wood pulp. One egg is laid (Noisy Scrub-bird) or two (Rufous Scrub-bird). Many of these characters, as well as the use of deep leaf-litter in which to scratch for invertebrate prey, are similar to lyrebirds, one of the word's great mimics. Although superficially scrub-birds don't seem like lyrebirds at all, the mimicry and song-stance do recall that group strongly, and now we know that they are biochemically linked. Presumably both arose long, long ago from some Gondawandian ancestor. Photos: The singing Rufous Scrub-bird Atrichornis rufescens was photographed by Michael Morcombe in 1968 in Gibraltar Range Nat'l Park, New South Wales, Australia. The painting of Noisy Scrub-bird A. clamosus is by Roy Doyle from Pizzey (1980). 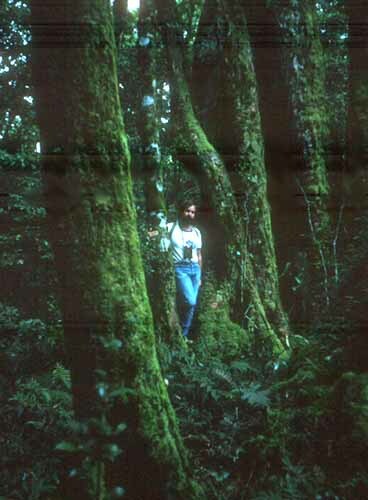 The self-portrait in habitat in Lamington Nat'l Park, Queensland, was in Nov 1983. Singing scrub-bird photo © 2003 Michael Morcombe, used with permission; all rights reserved; site photo © D. Roberson. Blakers, M., S. J. J. F. Davies, and P. N. Reilly. 1984. The Atlas of Australian Birds. Royal Australian Ornith. Union, Melbourne Univ. Press, Carlton, Victoria. Pizzey, G. 1980. A Field Guide to the Birds of Australia. Princeton Univ. Press, Princeton, N.J.